There are a lot of heroes that emerge during fires. People save pets, family members and other peoples' family members all the time. Regardless, what we are going to talk about today is not the saving of humans or pets, but rather, a man who saved what is most precious to him: his BBQ. Check out what Fresno resident Robert Wright had to say to the local news after saving his beloved meat, below. Gotta hand it to this character. Mr. Wright saw fire busting out of the windows of his apartment complex, and to his credit, he didn’t panic. Instead, he notes he immediately thought to “make sure” his ribs were alright and then went and got his family. 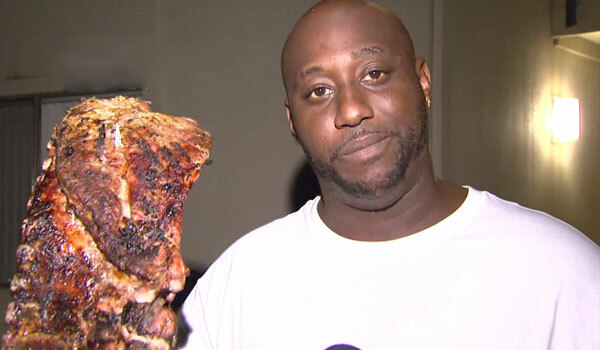 Even though his first instinct was to think of his ribs, he does say he got his kids safely out of the building before he went back in and forked his ribs, which he then holds up to the camera for the duration of the interview. I gotta say, it's a pretty nice looking hunk of meat. Later in the interview, Robert Wright gets a little more excited, calling the experience “real serious” and “frantic” before actually dropping a bleeped-out curse word, but despite the fact his apartment building burned and his family will probably have to spend the night in a motel, he seems to be in good spirits. The BBQ, after all, is pretty well cooked, meaning Wright and his family are going to eat well and have a pretty good night, despite the fire. It is moments like these that make me eternally grateful for the local news. Where else are we going to see people admitting to saving their BBQ before their families or find out why a 73 year-old man might purposefully punch a bear? The local news offers hours of endless entertainment, including random f-bombs that accidentally get dropped and people (read: usually dudes) who get up to weird shenanigans in the backdrop. I’m not sure any of these weird news moments will ever be as memorable as the guy telling this story with a straight face while he holds up the giant rack of ribs with his carving fork. I don’t know where news station KMPH Fox 26 found this guy, but I’m super thrilled the station did. Because his kids were, in fact, saved from the fire, the attention to his BBQ is hilarious. Probably one of the most entertaining bits we at CinemaBlend have seen in a long time. It’s even better than the other fire segment we covered recently, during which a local news crew totally missed a weed reference related to a fire in Antioch, CA. But in case you missed it, you can check it out here.